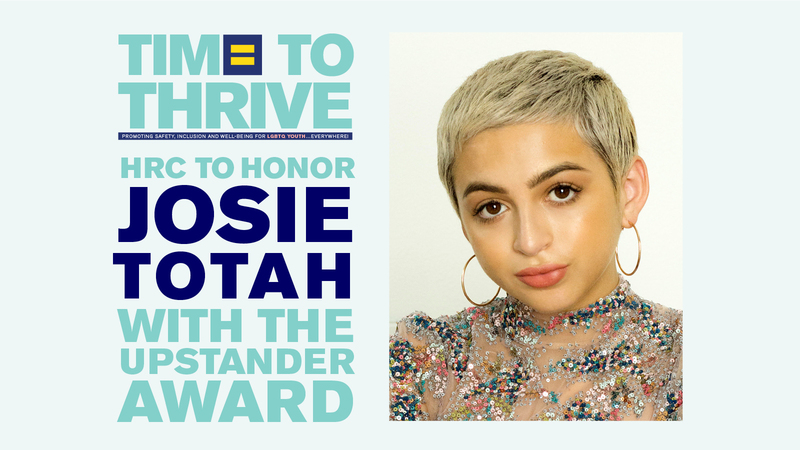 Today, the Human Rights Campaign Foundation (HRC) announced that it will honor actress and advocate Josie Totah with an Upstander Award at the organization’s sixth annual Time to THRIVE Conference on February 15-17 at the Anaheim Marriott in Anaheim, California. HRC also announced that the band OneUp will perform on the opening night of the conference. Last year, Totah, who starred in the NBC sitcom Champions, came out as transgender in a powerful op-ed for Time. “My pronouns are she, her and hers,” Totah wrote. “I identify as female, specifically as a transgender female. And my name is Josie Totah.” She explained that watching transgender teen and former HRC Foundation Youth Ambassador Jazz Jennings share her journey on her “I Am Jazz” reality television series provided a powerful model for her. At the time, both Totah and Jennings were 14. “I looked over at (my mother) in the middle of the show and said, ‘This is me. I’m transgender. And I need to go through this,’” Totah said. “My mother, who is immensely supportive and gracious, said, ‘Okay, let’s do it.’” Totah began her acting career at a young age, with breakout television roles on the Disney Channel and network shows, including a recurring role on Glee. Last year, HRC was proud to honor the young trailblazer with the HRC Visibility Award at the 2018 HRC Salt Lake Gala. At Time to THRIVE, Totah will join other special guests, including LGBTQ advocate and mother of Ellen DeDeneres Betty DeGeneres; President and Founder of the Dolores Huerta Foundation Dolores Huerta; parent-advocate, founder of FreeMomHugs and subject of an upcoming Jamie Lee Curtis project Sara Cunningham; transgender trailblazer Jazz Jennings and her mother Jeanette Jennings; Los Angeles Rams cheerleader Quinton Peron; and others. HRC previously announced that it will honor advocates Adam Rippon, Brian Coleman, E.J. Johnson and Judy and Dennis Shepard with an Upstander Award during the Time to THRIVE conference. HRC’s Parents for Transgender Equality Council, HRC’s Youth Ambassadors and HRC’s Welcoming Schools Program will also be featured at the conference.